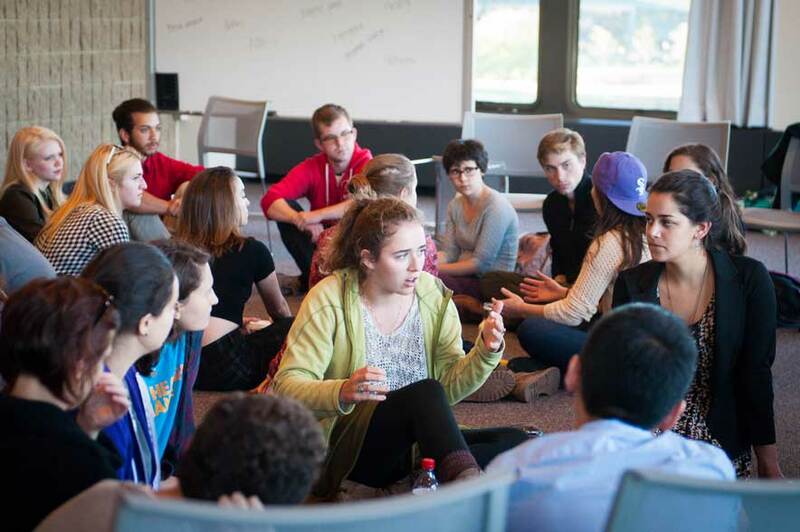 Students discuss violence in society during an Arts Alliance-sponsored event on Wednesday. The theater board hosted the event ahead of the opening night of the musical, “Assassins,” which examines people who have tried to assassinate U.S. presidents. Northwestern Arts Alliance led a discussion on experiences of violence Wednesday. The dialogue took place prior to “Assassins,” a musical examining people who attempted to assassinate U.S. presidents. Communication senior Alex Gold, who directed the musical, said the theater board wanted to have a discussion prior to the show to address how violence has changed since President Ronald Reagan was shot in 1981 — the most recent assassination attempt of a president. Communication senior Talia Weingarten, Arts Alliance’s artistic director, began the discussion by asking the group of about 30 people how they directly and indirectly experience violence. After framing the discussion, Weingarten asked the group to list traits students, faculty and staff identify with, such as race, ethnicity and socioeconomic status. She noted the University stresses a motto of “One Northwestern” but that in reality people’s identities and experiences are quite varied. The group then split into three smaller sections to discuss how people experienced violence. Communication sophomore Mary Kate Goss, Arts Alliance’s community engagement director, also helped organize the event. She described her high school cafeteria, which had racially segregated itself. The two sides of the cafeteria tended to divide by race into what was referred to as the “Black Market” and the “White House,” Goss said. She said that two groups ranged greatly in terms of their socioeconomic status and range of violence experienced. The discussion ranged from how media coverage affects perceptions of violence to opinions about human empathy, both toward perpetrators and toward victims of violence. Weingarten explained how New York Times columnist Nicholas Kristof realized that when he wrote about large groups of people facing atrocities, readers often had a hard time empathizing.